We are a multi-disciplinary department with responsibilities in instruction, research and continuing education in the disciplines of gross and microscopic anatomy, cell and systemic physiology, pharmacology, and neuroscience. Our mission: Cultivate an environment that fosters ingenuity, leadership and excellence in teaching, research and service. Our vision: Build the finest veterinary biomedical science department. The protein "Headcase," or Hdc, functions together with the protein "Unkempt," or Unk, to regulate tissue growth in fruit flies. "In our latest study, we identified 'Headcase,' or Hdc, and 'Unkempt,' or Unk, as two nutrient-restriction-specific tumor suppressor proteins that form a complex that acts to restrict cell-cycle progression and tissue growth in response to nutrient stress in Drosophila or fruit flies," said Dr. Jianzhong Yu, assistant professor and cancer biologist. Yu is collaborating with Naren Li, postdoctoral fellow; Dr. Yulan Xiong, assistant professor; and Qinfang Liu, doctoral student. They recently published an article on their latest research, "Headcase and Unkempt Regulate Tissue Growth and Cell Cycle Progression in Response to Nutrient Restriction," in Cell Reports. The study was supported in part by a grant from the National Institutes of Health's Kansas INBRE program, a startup fund and SUCCESS-FYI Intramural Grant from the College of Veterinary Medicine. The work is also supported by the Johnson Cancer Research Center at Kansas State University. "Given the role of the human counterparts of these proteins, our results suggest that Hdc and Unk may function as tumor suppressors in mammals," Yu said. "Although the human ortholog of Unk has not been studied in the context of cell proliferation, we showed that both Hdc and Unk are able to inhibit tissue growth in vivo in the Drosophila model. Thus, it is worthwhile in the future to investigate the growth control function of these two proteins, especially in regard to the formation of cancer tumors." *Emily Johnson, a pre-vet senior and student worker in the Anatomy lab, won first prize for her poster titled, “Rehabilitation of osteological specimens using an alkali-, acidic-, and enzymatic-based solutions." Her mentor is Dr. Pradeep Malreddy. *Miriam Martin, first year PhD student, won first prize for her presentation, “A field study to investigate the effect of Zuprevo administered alone or in combination with Banamine transdermal on the health and well-being of transported feedlot calves on arrival at the feedlot." Her mentors are Drs. Mike Kleinhenz and Hans Coetzee. *Jacob Herford won second prize for his poster, “Non-steroidal anti-inflammatory drugs reduce vas deferens epithelial MRP4 expression and prostaglandin export” in the Basic Sciences Poster category. His mentor is Dr. Bruce Schultz. *Sarah Greenway, third-year CVM student and worker in Dr. Masaaki Tamura lab, gave an oral presentation titled “Murine colon carcinoma growth inhibition and host antitumor immune response enhancement by water extract from Chorella sorokiniana cell membrane fraction." *Ron Orchard presented a poster, “Clinical interactions between oral fluconazole and intravenous ketamine and midazolam." One of his mentors is Dr. Butch KuKanich. *Ally Fitzgerald, third-year student, won third prize for her poster, “Clinical efficacy of an oral long-acting analgesic with a human abuse deterrent in perioperative dogs” Her mentor is Dr. Butch KuKanich. *Gail Huckins, intern in the Veterinary Health Center, won first prize for her presentation, “Pharmacokinetics of oral mavacoxib in Caribbean flamingos” in the Clinical Science Oral Presentations. One of her mentors is Dr. Butch KuKanich. *Peter Cho, a fourth-year student, won third prize for his presentation, “Evaluation of multiple doses of a long-acting oral opioid containing an abuse deterrent in dogs” in the Clinical Science Oral Presentations. His mentor was Dr. Butch KuKanich. *Zack Bieberly was awarded the Benjamin Kurz Research Scholarship. One of his mentors is Dr. Butch KuKanich. "Our department had terrific representation at all the sessions and I would especially like to thank Jacob Herford (Schultz), Meghan Lancaster (Kleinhenz), Elza Mathew (DeLong), Ravi Thakkar (Comer), Seok Chan Park (S. Choi) and Sarah Wilson (DeLong) and their respective mentors (in parentheses) for their participation and outstanding contributions to the success of this event," Anatomy & Physiology Department Head Dr. Hans Coetzee said. An internationally prominent and honored scholar and researcher will serve as Kansas State University's 2019-2020 Coffman Chair for University Distinguished Teaching Scholars. Dr. David C. Poole, University Distinguished Professor in the Kinesiology and Anatomy and Physiology departments, has been appointed to serve as the chairman, a position created in 1995 to highlight the university's commitment to excellence in undergraduate teaching and learning. Each chair is an acknowledged leading teaching scholar and conducts a research project or develops programs to improve educational methods. "I thoroughly enjoy teaching and learn at least as much from our students as they from me," Poole said. "The Coffman Chair, as I see it, will permit me to better leverage K-State's resources to promote teaching excellence by more effectively integrating the processes of scientific discovery into the classroom." Poole will spend his year as Coffman Chair evaluating which practices of the Association of College and University Educators are producing the best results with Kansas State University students, including those who go on to professional schools. The analysis will survey the up to 160 K-State faculty members who have completed or are currently enrolled in the Association of College and University Educators course to improve teaching and learning. The highest obligation or responsibility of Kansas State University and any other university, Poole said, is to teach effectively and make students think, often beyond what they and their previous aspirations allowed. "I take that charge very seriously," Poole said. "To facilitate a truly transformational process for our students, we must embrace the most proficient methods and the latest in scientific discovery." Earning the university's highest academic ranking of university distinguished professor in 2018, Poole's research has helped define how oxygen is transported from the lungs to be used by tissue mitochondria. Using innovative models at rest and during exercise, Poole has identified key sites of metabolic control in health and disease. These observations have driven a paradigm shift in the understanding of how capillaries function and advanced novel therapeutics for heart failure. He has been awarded more than $5 million as principal investigator and $17.9 million as co-investigator in research grants from the National Institutes of Health, National Science Foundation and the American Heart Association. Drs. Yi-Hsien Cheng and Wei-chun (Joe) Chou, from Dr. Zhoumeng Lin's laboratory, have been named winners of 2019 Regulatory and Safety Evaluation Specialty Section Postdoctoral Excellence Awards by the Society of Toxicology. The awards were presented at the society's Regulatory and Safety Evaluation Specialty Section Meeting and Reception in March 2019 in Baltimore, Md., where Cheng presented a poster entitled "Assessing Delivery Efficiency of Nanoparticles to Tumors in Tumor-Bearing Mice Using a Physiologically Based Pharmacokinetic Modeling and Simulation Approach." Cheng received the SOT Regulatory and Safety Evaluation Postdoctoral Excellence Award and the Biological Modeling Specialty Section Best Trainee Abstract Finalist Award. Cheng has also been selected as the postdoctoral representative for the Society of Toxicology Biological Modeling Specialty Section. Chou received the SOT Biological Modeling Specialty Section Andersen-Clewell Trainee Award and the SOT Regulatory and Safety Evaluation Specialty Section Postdoctoral Excellence Award. He did an invited platform presentation entitled "Bayesian Evaluation of Physiologically Based Pharmacokinetic Modeling for Perfluorooctanesufonate to Characterize the Interspecies Uncertainty Between Mice, Rats, Monkeys and Humans: Development and Performance Verification. Dr. Miao Li, a member of Dr. Zhoumeng Lin's laboratory team, is the winner of the Society of Toxicology Risk Assessment Specialty Section Perry J. Gehring Best Postdoctoral Fellow Award. With his poster, titled "Integration of Food Animal Residue Avoidance Databank Empirical Methods for Drug Withdrawal Interval Determination with a Mechanistic Population-Based Interactive Physiologically Based Pharmacokinetic Modeling Platform: Example for Flunixin Meglumine Administration," he was chosen as the winner of the SOT Risk Assessment Specialty Section Perry J. Gehring Best Postdoctoral Fellow Award, the AACT and InnoStar Best Abstract Award and the Biological Modeling Specialty Section Best Trainee Abstract Finalist Award. Li was honored at a reception in March 2019 at the Hilton Baltimore Holiday 3 during the annual Society of Toxicology meeting. His main research interest is the application of PBPK modeling to conduct interspecies extrapolation for toxicology or human health risk assessment. His research project focuses on using PBPK modeling to predict tissue residues and withdrawal time for veterinary medicines in food-producing animals. Drs. Cathy Sparks and Pradeep Malreddy presented concurrent sessions on "Incorporating Active Learning into a Large Enrollment Veterinary Anatomy Course" at the Lilly Conference on Teaching for Active and Engaged Learning Feb. 28 in Anaheim, Calif.
Two PhD students in Dr. Hans Coetzee's lab, Miriam Martin and Andrew Curtis, have each received two scholarships: Dr. Albert L. Burroughs Memorial Awards and Dr. Leo and Gloria Whitehair Graduate Research Enhancement Endowment Awards. Congratulations to Gail Eyestone for her selection as the recipient of the 2019 President's Award of Excellence for Unclassified Professionals in recognition of her 17 years of professional service at Kansas State. The award ceremony is scheduled for 3 p.m. on Tuesday, May 7, at the K-State Alumni Center Ballroom. Lt. Col. Mark Weiss has been recognized by the Civil Air Patrol's North Central Region as 2019 MGen Jeanne Holm Aerospace Education Officer of the Year. He will be presented with his award at the joint NCR/Missouri Conference in Jefferson City, Mo. Trenton Colburn, a doctoral student in the Kansas State University Kinesiology program, has received an National Institutes of Health F31 Pre-doctoral Fellowship to support his Anatomy & Physiology studies. The award totals $32,848 for Year 1. Colburn's sponsor is Dr. David Poole and his mentor is Dr. Tim Musch. During the K-INBRE annual meeting Jan 18-20, 2019 in Overland Park, Kan., Kansas State University student Molly Bassette won the Best Poster Award in the Undergraduate Research Division. 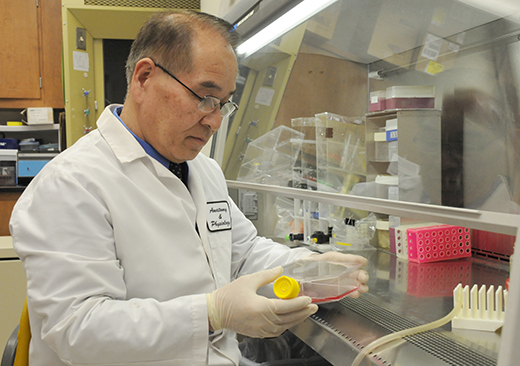 Bassette is a research assistant in Dr. Masaaki Tamura's laboratory in the KSU Anatomy & Physiology Department. Kansas State University's Dr. Jianzhong Yu also received award recognition during the session for his K-INBRE developmental biology research. D r. Tim Musch, University Distinguished Professor in Kinesiology, and Anatomy & Physiology, has been selected as the February 2019 Faculty Member of the Month by the College of Veterinary Medicine's Class of 2022. Students highlighted Musch's consistent ability to engage them, his attentiveness to students and his attempts to develop personal relationships with them. Musch was a winner of the Honor Award from Environmental and Exercise Physiology section of the American Physiologic Society in 2018. Anatomy & Physiology professor Dr. Butch KuKanich has earned the Bayer Teaching Excellence in the Second Year Award. Four faculty members, including KuKanich, have been recognized for preclinical teaching excellence in Kansas State's College of Veterinary Medicine. Dr. KuKanich, Dr. Ryane Englar, Emily Klocke and Justin Thomason each won honors for teaching excellence in courses involving first-, second- and third-year CVM students. Designations were based on student vote. KuKanich has also been informed that is abstract, "Incorporation of a Human Abuse Deterrent into a Long-lasting Oral Opioid Formulation in Dogs," has been accepted for presentation at the 2019 American College of Veterinary Internal Medicine Forum Research in Phoenix, Ariz., in June 2019. On Dec. 7, 2018, Mike Kleinhenz received his PhD. Kleinhenz, whose research field specialty is clinical pharmacology, was also honored with a cake party in the department. His research project focused on pharmacokinetics and analgesic properties of transdermal flunixin meglumine. Kleinhenz will continue work at Kansas State in the Department of Clinical Sciences, doing clinical instruction for seniors in the Livestock Field Services section. He will also continue to work with Dr. Hans Coetzee's lab team. Dr. Hans Coetzee has won the Boehringer Ingelheim Ruminant Well-being Achievement Award for his work in the field of animal pain management. He was given the award on Aug. 30, 2018 in Sapporo, Japan. During the 33rd World Veterinary Congress in Incheon, Korea, the inaugural World Veterinary Association Global Animal Welfare Awards were given to 6 veterinarians, representing each WVA world region. Coetzee emerged as the winner from the U.S. region. In 2017, the Anatomy & Physiology Department Head earned the American Veterinary Medical Association's Animal Welfare Award. Dr. Steve Ensley's research into the perils of deadly blue green algae drew regional media coverage from TV station KSNT of Topeka, Kan.: https://www.ksnt.com/news/local-news/kansas-state-university-studying-deadly-blue-green-algae-in-kansas-waters/1374379037 (photo by Joe Montgomery). Ensley also recently presented 5 hours of continuing education at the Mississippi Veterinary Medical Association in Starkville on Feb. 22, 2019, and presented a talk on veterinary analytical toxicology in Virginia on Feb. 26, 2019. A National Institutes of Health-funded research project seeks to produce a therapeutic compound that could be administered directly to the lungs in aerosol form.